The Pyramid Saimira order is a landmark in SEBI's history. It seems to be grounded in high quality investigative work and if it survives appeal, it will put a new level of fear in the minds of the bad guys. On this, read : Palak Shah in Business Standard, and Vivek Law and Priyal Guliani in Mint. Writing in Business Standard, Mahesh Vyas disagrees with the gloomy scenario for corporate investment, drawing on the information in the CMIE Capex database. Writing in Business Standard, Sunil Jain reviews the fracas about Indians holding money in Switzerland. For recent research on capital movements through trade misinvoicing, see this work by Abhijit Sen Gupta, Ila Patnaik and me: slideshow, paper. While on this subject, see Somasekhar Sundaresan in Business Standard on the messy legal foundations of India's capital controls. The system of control that seeks to tie down India's capital flows is grossly out of touch with the realities of India's openness today. Forbes has a fascinating article by Laurence J. Kotlikoff and Edward Leamer, with fundamental thinking about banks. They trace the problems of banks to the fundamental contradictions of having a highly leveraged financial firm, with assured returns and full liquidity for depositors, and opaque + illiquid assets. I agree with this gloomy prognosis. A more fleshed out argument is in this pair of articles -- link and link -- which were opinion pieces in 1999. I stopped chasing those lines of thought because it seemed dishearteningly hard, trying to sell a world without banks as we know 'em. But if you are persuaded by these arguments, then you will like a world where we do more finance through securities markets, through `defined contribution and NAV-based' financial firms (i.e. direct household participation in financial markets, mutual funds and DC pensions), and less through `assured returns' financial firms such as banks, DB pensions and insurance companies. In a perverse way, India's prodigous mistakes of policy on banking have helped steer the country into a more market-dominated financial system, which has helped build a better financial system. Since we're unlikely to reconstruct the economy in radical ways, we have to confront the problems of banks. I feel the most important element of safe and sound banking is: a proper deposit insurance mechanism. Chapter 6 of Raghuram Rajan's report is the best blueprint out there about setting up a deposit insurance corporation, and other dimensions of improving systemic risk (see `V. Preventing Crisis and Dealing with Failure'). You might like to also see this picture on banking reforms. On 14 October 2008, Jahangir Aziz, Ila Patnaik and I released a short note on what was going on. It was titled The current liquidity crunch in India: Diagnosis and policy response. On Monday (20th April 2009), Ila Patnaik has an article in Indian Express with one more piece of evidence that the APS story was basically on the right track. Today, when we look back at the APS paper, it seems mild. But I distinctly remember at the time, the world was much more confusing. Lehman died on 15 September. After that, there was a `fog of war' problem: a lot was going on, there was information overload in many ways, lots of critical information from within RBI is not released into the public domain in a timely manner or is not released at all, and the statistical system has such long lags that on 10 October, when we started writing, almost nothing was known about the period immediately after 15 September. Speaking for me personally, I had the right starting conditions in terms of being oriented towards the themes of de facto convertibility, Indian multinationals, etc. I should have got the story quickly after 15 September. But still, it took me a long time to understand what was happening. Similar problems -- on an immensely magnified scale -- have afflicted crisis responses everywhere in both the private sector and governments. Whether it was Northern Rock, Bear Stearns, or Lehman: analysts and decision makers have been ambushed by difficult questions, very little time within which to make calls, and bad information at the time. With the benefit of hindsight, it's easy to criticise what was done, but this stuff is hard. In good countries, inflation has become boring, owing to the success of inflation targeting central banks, and the distinction between the real rate and the nominal rate has become less prominent. But in India, inflation volatility is immense, and it is particularly important to look at the policy rate in real terms. 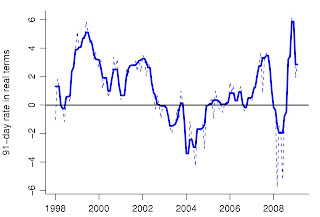 Shift to a time-series of inflation measured as point-on-point changes of the seasonally adjusted series. Now run through the time-series, starting from the beginning. At each point in time, only use data visible upto that point. Fit an ARMA model to the inflation time-series. Use that model to make forecasts for inflation for the next 3 months. Average those forecasts and you have a forecasted inflation over the next 90 days. Define the 90-day treasury bill rate (on the market) as the policy rate in nominal terms. This helps us get away from the fog of multiple instruments that RBI uses. The argument here is: in the bottom line, monetary policy is about the short rate, and the 90-day rate is the short rate. RBI uses various levers such as CRR, the repo rate, the reverse repo rate, the bank rate, etc. to try to influence the short term rate. The 90-day treasury bill rate shows the summary statistic of what is happening in monetary policy at a point in time. So now you are holding: a time-series of the policy rate in nominal terms (i.e. the 90-day treasury bill date) and a time-series of forecasted inflation at every point in time (i.e. 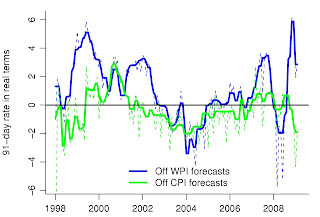 the forecasts of point on point changes to seasonally adjusted WPI, made carefully to only use information available at time t when forecasting for months t+1, t+2 and t+3). Subtraction yields the time-series of the real rate. Smooth this series so as to get away from the month to month fluctuations to some extent. In the graph below, the deep line is smoothed and the light (dashed) line is the underlying unsmoothed data. The smoothing here is done using the smooth(x, kind="3R") function in R, which is a simple non-parametric smoother. The Asian crisis broke in August 1997 and India tested nuclear weapons in May 1998. India's downturn ran from 1998 till 2002. Early in that period, monetary policy tightened by around 600 basis points. From 2001 onwards, the greatest business cycle expansion in India's history commenced. Monetary policy responded to this by cutting rates from 2001 till 2004. In good times, monetary policy made it better. Then tightening took place from 2004 till 2007 but in the great inflation of 2008, the real rate again dropped. The happy days ran from 2002 till mid-2008. When bad times were clearly upon us (from 9/2008 onwards), monetary policy seems to have tightened. How good is this estimator of the real rate? Only as good as the inflation forecast. What would be great is to have a liquid market for inflation indexed bonds and a liquid market for nominal bonds; the difference between these would be a market-based estimator of expected inflation. This would take into account myriad factors that affect inflation. In contrast, forecasting inflation using ARMA models is quite lame. It only uses the time-series structure of inflation and fails to take into account all the other factors that affect inflation. This can and should be done better by going to a multivariate setting. However, I do think that this is a useful first cut, and it's more useful to look at this rendition of the real rate as compared with only looking at the policy rate expressed in nominal terms, as is currently done in India. My profession consists of helping people in their legal responsibility of complying with tax laws. On 1 April 2009, I was on the website of the Income Tax Department. I realized that the department has brought about an "8th amendment to the Income Tax Rules amending rules 30, 31, 31A, 31AA". As I went through the amendments I realized that the changes were far reaching. The challans for tax deposit, the forms for TDS returns and the format for tax certificates have all undergone significant changes. In addition, a new form has also been introduced. All these changes were applicable with effect from 1st of April 2009. But the notification was released on 31st March so there was no warning. I called up some members of CBDT. They had not heard anything of about this 8th amendment. Then I called up Directorate of Income Tax (Systems) who is responsible for implementation of computerisation of income tax. They did not know anything about it. NSDL is supposed to be integral to computerisation of income tax. Everyone talks about the TIN and we use it every day but it is not ready for these new forms. Banks and the CGA had also not heard about these new forms. So it wasn't about a Stalinist government that wanted to keep its citizens in the dark. Most of government was also in the dark. This lack of communication is a bad idea. Income tax department should only make these changes through a proper consultative process. Their project management will become impossible if their own IT guys do not know about these changes. The challan for tax deposit has been changed and has become a combination of a challan and a mini return. The banks will not be able to handle it themselves unless the TIN is ready to first receive it and pass the payment responsibility to the banks. So until TIN and banks are ready with the changes, it seems to me that nobody needs to deposit TDS anymore. Until TIN, banks, government deductors and small deductors are all part of an IT system, it will not work. TDS deposits will drop. The department has introduced a new unique transaction id for each deductee transaction in the TDS return which is to be included in Form 16 or Form 16 A by the deductor. The taxpayer will transcribe the same into the IT return. It now looks like the TDS return can avoid supplying the PAN number of the deductee. There is going to be a new problem of tracking thousands of unique transaction IDs. Many of my clients would be happy not to give their PAN in all transactions. After years of pushing in favour of PAN, I do not understand why this is now being abandoned. by Anmol Sethy, originally appeared in Financial Express on 6 April 2009. ADRs (American Depository Receipts, equity of foreign firms trading on US Exchanges) of Indian IT companies like Infosys, Wipro and Satyam, have until recently traded at a consistent premium over local counterparts. The existence of these premiums has been the subject of active discussion amongst traders and arbitraguers. However, over the last six months, an unlikely candidate has beaten these IT companies at this game, and this candidate is Tata Motors. This has happened in spite of not-so-impressive operating performance by the firm. It has been mired in difficulties regarding the stumbling Nano, an undersubscribed rights issue, dipping car sales, questions over its Jaguar-Rover acquisition, and an overall gloomy economic scenario. Until Mid October, the ADR premium of Tata Motor was near zero (click on the graph below to see it more clearly). In fact, it sometimes dropped below zero -- i.e. the ADR was at a discount as compared to the local NSE/BSE stock. This kind of behavior is generally seen in stocks of firms from countries like Mexico, Brazil etc where there are no capital controls on conversion of local stocks to the ADR and vice versa. However, in India, RBI regulations impose a peculiar capital control. Though there are no restrictions on how many ADRs can be converted into local stock, there is a restriction on the opposite conversion. Local shares can be converted to ADR only if the existing number of ADRs does not exceed the total ADRs issued by the firm through its primary and secondary offers. This restriction on outflow conversion generally induces an upward pressure on the premium, as the float available for trading in US Exchanges becomes restricted. This explains a good part of the existing premium in IT firms. As the demand for ADRs far exceeds the supply, an ADR premium develops, which cannot be arbitraged away. In such a scenario, the sustained existence of near-zero premiums for Tata Motors ever since its launch in September 2004 is intriguing. While IT is considered to be an Indian strength and something which India is recognised for, the same cannot be said about the automobile sector. An ADR investor sitting in US, who is often an individual and not a financial firm, will be influenced by what is talked about regularly in the news and around coffee tables. This lifts the premiums of these firms. Also see this slideshow on the subject. To truly appreciate the power of this `buzz' in the US, consider the daily volume traded. Suppose a firm from developing world announces the launch of a new revolutionary product in coming days, This firm would start getting ample coverage everywhere in the media. The investor will suddenly sit up and notice. This will increase the activity of the ADR. This is what happened with Tata Motors. News about the Nano launch first came in on around March 18. Suddenly, the daily volume traded in ADR jumped two fold to 1449757 ADRs/day from the average of 693496 seen before this year. The same however cannot be said for the local stock. Consequently the premium has also jumped, even exceeding 50% on March 24 and 25. Though this may explain the latest surge, the fascinating question is: What has changed since Oct 2008 to justify a persistently large premium? One can be the fact that the premiums are not only driven by the performance of the foreign company, they are also driven by how local companies are performing. If in the same sector, local companies are struggling, while the foreign company seems to be relatively better off, the foreign company stock will perform better. Investors who have a mandate of undertaking sector specific investments for the sake of diversification, investment policies, or sheer interest in that sector, would withdraw their capital from local firms and invest in the foreign firm. However, in its local market, where the foreign firm will be compared with its domestic competitors, no such activity would take place and the price gap would widen, raising the ADR premium. This is probably what happened with Tata Motors. The Detroit Three, namely GM, Chrysler and Ford, have been in all sort of financial troubles, especially after the collapse of Lehman. Dwindling sales, imminent bankruptcy and government bailouts probably scared away investors interested in the automobile sector to other automobile stocks like Tata Motors. This factor was active only in the US and not in the Indian markets, because institutional investors who take interest in the automobile sector are probably not FIIs (who tend to be the firms who take interest in India). This was not a particularly rosy time for Tata Motors either, with a failed rights issue and a decline in car sales by near 20% in October compared with the previous year. But Tata Motors seems have fared better than the Detroit-3. I just read Johann Hari on Dubai in The Independent and it is shockingly bad. It really makes you feel bad for poor people from India and Bangladesh who are working there. And, it makes me wonder afresh whether it's possible to do international finance in an authoritarian country. I feel finance critically requires the rule of law, and strong constitutional foundations for freedom of speech. Also see this, dating back to December 2006. Industrial production, stock prices and trade are doing as badly in these early months, if not worse. But the policy responses are better; our knowledge and economic policy institutions are better when compared with 1929. India is likely to be in the worst downturn since the early 1990s, but at present the politics does not support an economic policy response of the quality of what was done by Narasimha Rao in the early 1990s or Vajpayee over 1999-2002. See Somasekhar Sundaresan in Business Standard and this editorial there. We are headed into some difficult weeks. See the editorials in Indian Express and Financial Express, Jayanth Varma, and the background to this.